Sunday October 25 1:00 PM IT CAME FROM OUTER SPACE (1953) 81 min. D: Jack Arnold. Nobody believes an astronomer (Richard Carlson) after he observes a spaceship crashing in the Arizona desert. As strange events begin to pile up, the xenophobic desert populace succumbs to panic! Filmed near Palmdale and Victorville and co-starring Barbara Rush, Charles Drake, Joe Sawyer, Russell Johnson and Kathleen Hughes. 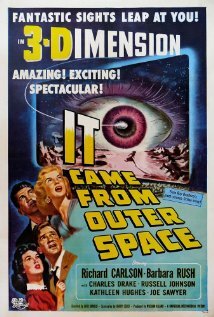 Co-written by Ray Bradbury, this seminal sci-fi thriller also boasts an eerie music score composed by the great Henry Mancini. © 2019 Palm Springs Classic Science Fiction Film Festival.